I'm afraid this blogging thing is no longer working for me, at least for a while. Why I started to blog in the first place was to keep me motivated and for the community. I no longer find blogging motivating, instead it's become an obstacle. Or mainly taking (good) photos is the obstacle. I've gotten tired of taking photos of before and after or in between. So either I just do and don't take photos or I postpone things till forever because I've not taken photos. That last scenario is the worst. It should not go like that. Then I'm tired of editing photos, the whole process annoys me at the moment, it takes too much time and there is better things to do right now. Writing posts is not the biggest issue and I've actually done lots of things I could blog about, but those photos, I don't have those. And my texts are not so fluent or fun or deep that I could have a text blog. I'm not sure I will completely stop blogging but I will keep a sabbatical for some period of time. I will miss this, but I'll keep following your blogs (if you have one). Today Likka turns one. Wow. Where did the year go. But I'm happy it did, toddlers are way more fun. We celebrated Likka's birthday with the family on Wednesday and with friends yesterday. We kept things simple, even the cake was decorated with just a pile of mini marshmallows and candy on the sides. Likka got to eat a few marshmallows and then those were all she wanted to eat. 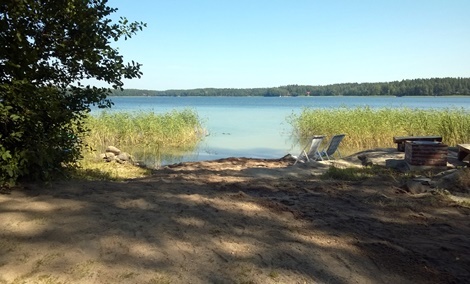 Today we are leaving for the annual crayfish party at our friends' cabin, that is why we celebrated Likka's birthday couple days beforehand. Our dishwasher broke, it leaked most of the washing water on the kitchen floor. New washers are very energy and water efficient but our old one was not (it was 30 years old!) and so we had a real flood in the kitchen. Also bad thing is that we have a parquet in that room and you know what happens to parquet when it gets wet, it starts to bubble. I did dry the floor with bathing towels right after the dishwasher had leaked and I assumed that a good drying with a fan would be enough and there would not leave any damage. Next day my dad came to help with removing the old washer and while here he came to the conclusion that the floor will not dry nicely and since he is not a person to waste time he started to rip off some strips from the parquet. We had some parquet left over from some previous renovation and next day my dad and A put the new old pieces of parquet on the floor. So now we have a new floor. There is bit of a colour difference between the "new" parquet and the old, but I'm fine with that. I have for quite some time planned to do some bigger renovation to the kitchen, so there is no point changing the whole floor now. But that wont happen any time soon. And besides the floor was not that perfect before either, so this colour difference is not a big deal. Next we need to buy a new dishwasher. Oh and put the moldings back. In between of making more cushion covers for the boat (yes those are still unfinished) I made three tetrahedron bags for Likka to play with. The tetrahedron bags have dried peas inside. These as many other of my crafts was inspired by Hupsistarallaa. 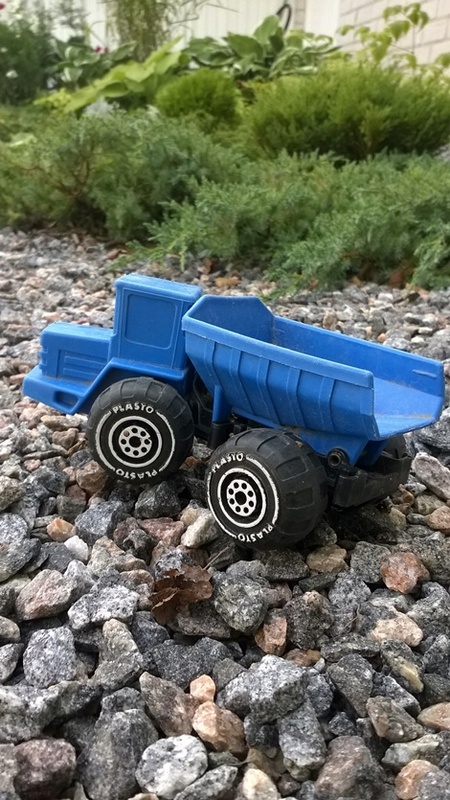 Norsis had made similar for her son over a year ago. The pattern is from hääräämö blog. I tried to find similar pattern for you in English, but with a quick look I could not find one, so the pattern link is now just in Finnish, but the pictures are pretty good, you might not need it in English anyway. Well hello! Long time no see. Whew, we have been busy, we have not spent much anytime at home. Hmm.. where to start... We've been allover Finland. 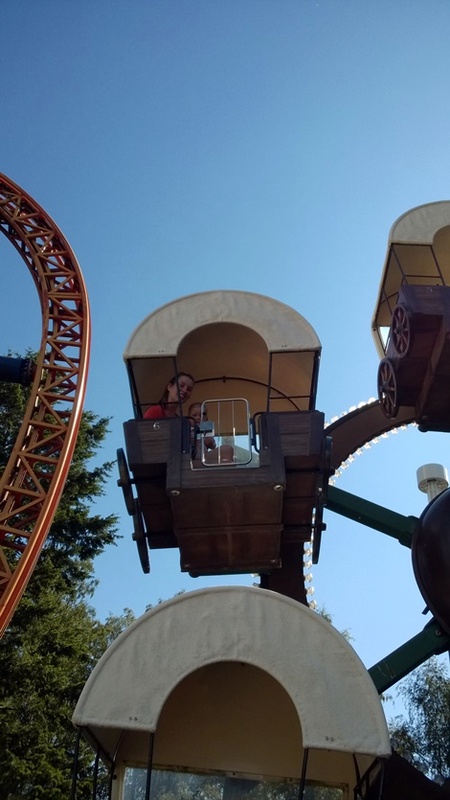 Well first at Linnanmäki amusement park in Helsinki. It was Likka's first time in an amusement park and she went to six rides already, to some with me, to some with A. 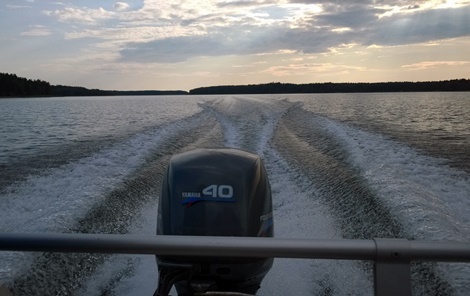 Then we headed to Tammisaari in south of Finland to a friends' cabin. There we made a beach. 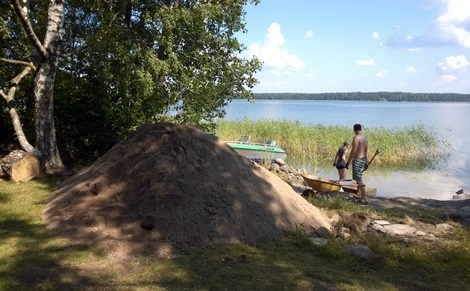 Which means that we shoveled one truck load of sand into the sea. 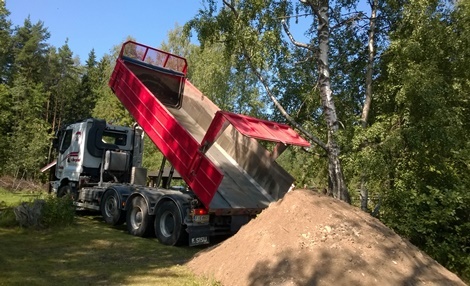 It was lot of work, but it was fun to do some hard labour for a while. Also at the cabin we did some boating. After one night at home we packed the car again and started a road trip to Ostrobotnia where my father's father lives. We drove the whole five hour drive there on one day and I must admit that it was a bit too much, we were awfully tired when we were finally there, the problem was that Likka was not tired much at all since she had slept most of the trip. Well we slept the night at my father's fathers condo and next day visited his lady friend, whom we had not yet seen. 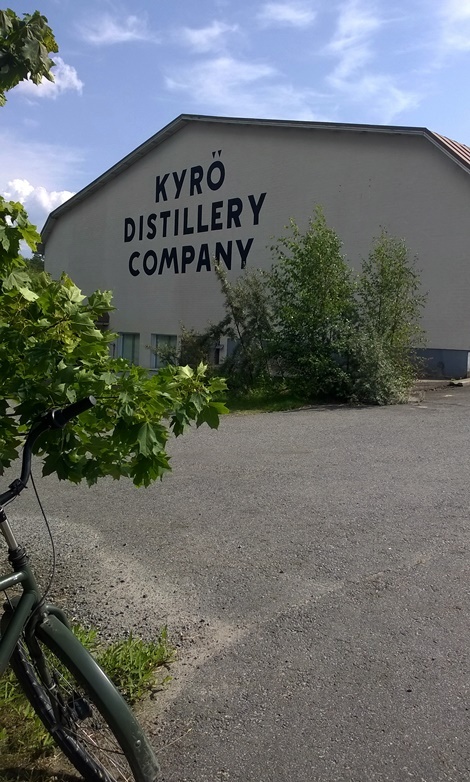 On the afternoon we continued our journey and headed to Tuuri, but on the way there was Isokyrö, a place where a school friend of ours has founded with four other guys a rye whisky distillery - Kyrö distillery company. I tried to call our friend to get more info where the distillery is and if he would happen to be there so we could even get to see the place from inside. Unfortunately I was unable to reach him, but we resorted to locals and asked a random passer-by if she would know where to found the distillery and of course she knew where it was and also was able to tell us that next to the distillery is a harvester and agriculture fair (!) 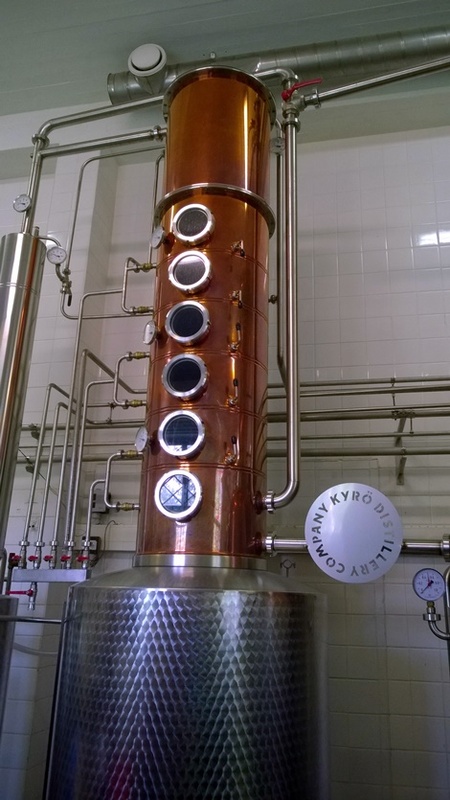 and that in the distillery they are having tours every hour. So even though I did not get a hold of our friend we were still able to see the distillery from the inside and hear stories about the history and distillation process. 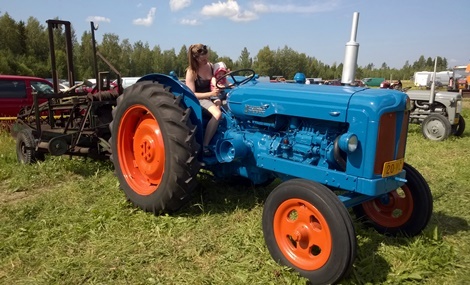 We also visited the agriculture fair, clearly we were not the target group for it, but it looked so fun and what are the changes of running into such an event anytime again. 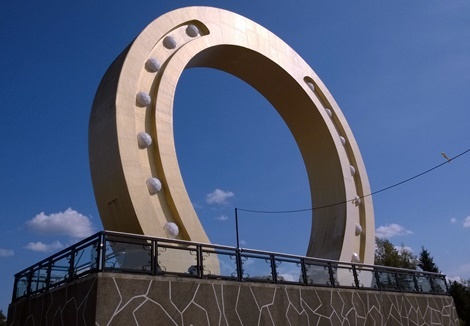 After spending a few hours in Isokyrö we drove to Tuuri (picture of the giant horse shoe is from there). In Tuuri is placed one of the biggest shop of whole Finland, it is one single giant building and ridiculously large parking lot in the middle of nowhere. The stuff in the shop is nothing special, same stuff you can buy anywhere, but the place is a sight, so ridiculously big and as mentioned located in a place far from any bigger town or city. After spending way too much time in Tuuri we drove to Ähtäri where we had booked a farm accommodation for one night. In Ähtäri on the next day we met a mommy friend of mine, her husband and their son who is five days younger than Likka. 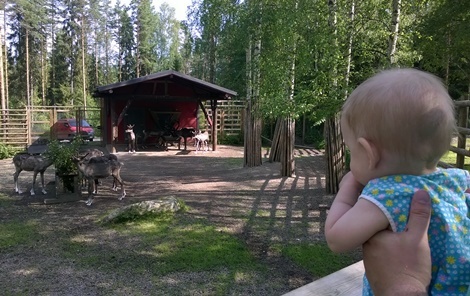 We went to the Ähtäri zoo together. 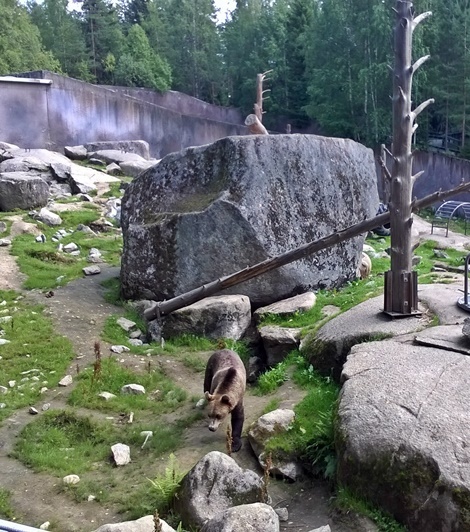 Unlike most zoos it has mainly local animals, which in our case are bears, dears, foxes and so on. I was pleasantly surprised with the zoo, there we actually saw lots of animals, usually in zoos the animals have hidden somewhere and you can only see what appears to be an empty cage. In Ähtäri we also experienced one of the biggest thunder storms I've been in, luckily we had left the zoo area already and were in shelter looking at the lightning. 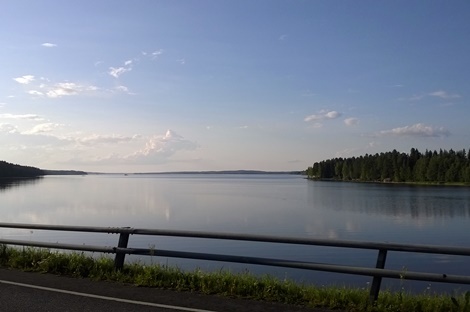 From Ähtäri we drove to Virrat, where another friend of ours has a cabin. There we spent couple of days and then headed home. Well then on the third vacation week we went sailing. 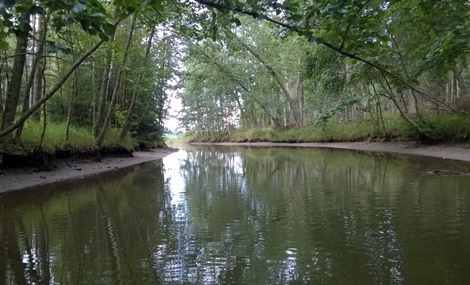 A's parents had sailed our boat to Kasnäs in south west parts of Finland and there we changed the crew. We had only sailed very short trips with Likka before so I was bit afraid if it's going to go well, but Likka took the sailing very nicely. The biggest problem on the boat with Likka was the sun and the heat. We had to somehow shade her all the time but so that she would not feel too hot. We dressed her into pajama overalls and tried to keep her in shade and offered water to drink frequently. We had a bike seat for her on the boat which we attached to the spray hood. She mostly enjoyed sitting and even sleeping on that seat, so it was easy to sail with her. We sailed on a fairly small area and ended our sail to Hanko where A's parents took over and are now as I'm writing this sailing the boat back home. So far we have had an amazing summer holiday. Sorry for the long absence from the blog, but I have been way too busy with all the traveling. I'll post soon again. At a close by town center I saw a woman/teen wearing lace shorts, maybe these, or similar. Those shorts inspired me to make another set of bloomers for Likka. I have had scraps of lace just waiting in my crafts stash and now the pants were a perfect use for those. I used the same pattern as I did for the previous bloomers. Some of the lace scraps I had were just a centimeter wider than I needed, just perfect, no leftovers anymore. There is lace covering only the bum. There is eight pieces of lace, which of only two are exactly similar. Not all the lace I had was white, there is also yellow, pink and blue lace. The pants turned out bit more funky than I had envisioned, but that is ok, I like funny clothes. 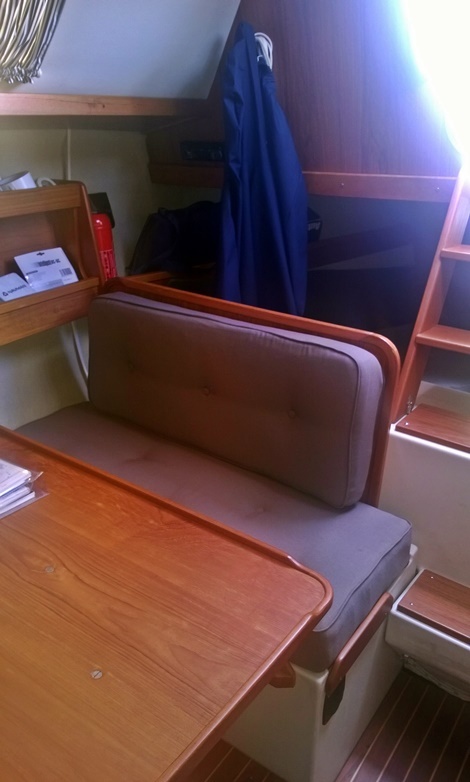 Remember I had some mattresses and cushions to recover for our boat? I have not got all of them done. 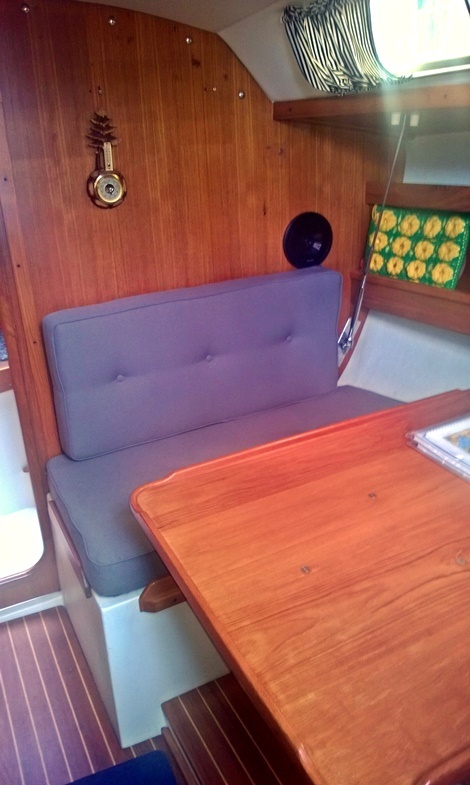 The only ones that are done are the seat cushions for the boat's kitchen. There is still the mattresses to cover for the peak and the rear. That makes six mattresses altogether. But five is done too, so about half way there. Yay! I finished these many weeks ago and I took these photos long ago. I had hopes I'd take new better photos but every time we've visited the boat I have not had the good camera with me, so I'm afraid you'll have to settle for the dreadful pictures I took with my phone. Sorry. What has been slowing down the sewing of the covers is the fabric. I think we chose a bit poor quality fabric. It frays really easily, plus it stretches on the other direction which makes it very difficult to sew and cut accurately. Also the old covers for the cushions are broken and stretched too, so the pattern I have cut out from the old covers are not very accurate either. So I have been bit disappointed with the quality of my sewing and it has not inspired me to move on with the project. 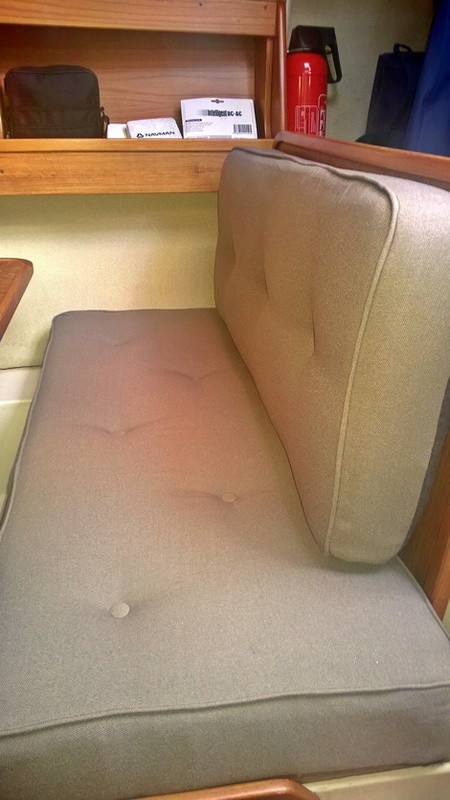 In my opinion the covers look really bad from some places, but luckily adding the shank buttons on the cushions makes them look more professional than they are. Once I get a few more of these covers done I will take better photos and maybe change these terrible photos on this post. A's mom sewed curtains for the windows. Those are made from black striped cotton. 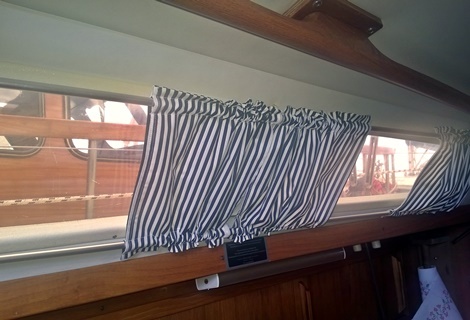 The curtains fit really well to the boat. She did a good job.